Tube Art: Did you see him? Eye-contact on the Tube is a total no-no, unless you’re a looney or a foolish chancer fishing for love. So when a bloke with a moustache on the Bakerloo southbound platform, Oxford Circus, looked at me and held my gaze for more than the standard microsecond, it was odd. Of course, in London, you just pretend these things don’t happen, and you certainly don’t break step. Maybe he was a lost Mexican revolutionary dreaming of a tortilla (he sort of looked that way). 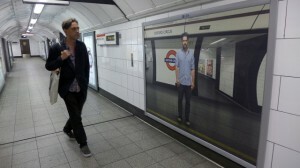 Hurrying past him towards the Victoria Line, I notice a big photo poster of a man standing at Oxford Circus. Which is here. Hold on, he’s got a moustache… I know this guy! I take a few steps back to the Bakerloo. Yes, that’s him, even wearing the same blue shirt. Er… so, what’s it all about? Michael Crowe, himself a man of letters, explains- he’s an art event, Oxford Circle by Jon Rubin. He was installed there a fortnight of afternoons up to August 12th. Sometimes no-one clocks him for ages, he reported, sometimes there’s a looney like the man carefully sweeping absolutely nothing with his shoe onto the track. And sometimes nice people just want to tell him they just saw him on the poster. 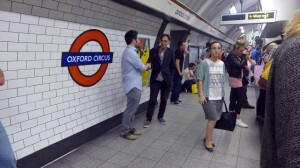 Talk about Art on the Underground- this wasn’t one of the sometimes-exceptional graphic works that program offers those not absorbed in a mobile screen or newspaper. This was the reality of the underground- a fleeting real-life event that addressed the old paradox of alone in the crowd, nowhere more prevalant than in London’s teeming subterranean labyrinth. It tackled head-on the urban aversion to contact. Not many may have got it, but if you did, it stopped you in your tracks, and amidst the madding crowd, made you re-assess. Art should make you re-assess, at least on first encounter. ‘A good service is running on all lines’ says the familiar voice in the Underground- pity this particular one has left the platform. Herbert Wright writes about architecture, cities and art. He is contributing editor at Blueprint magazine, and a contributor to the Royal Institute of British Architects Journal. This entry was posted in Art, Articles by Guest Writer. Bookmark the permalink.